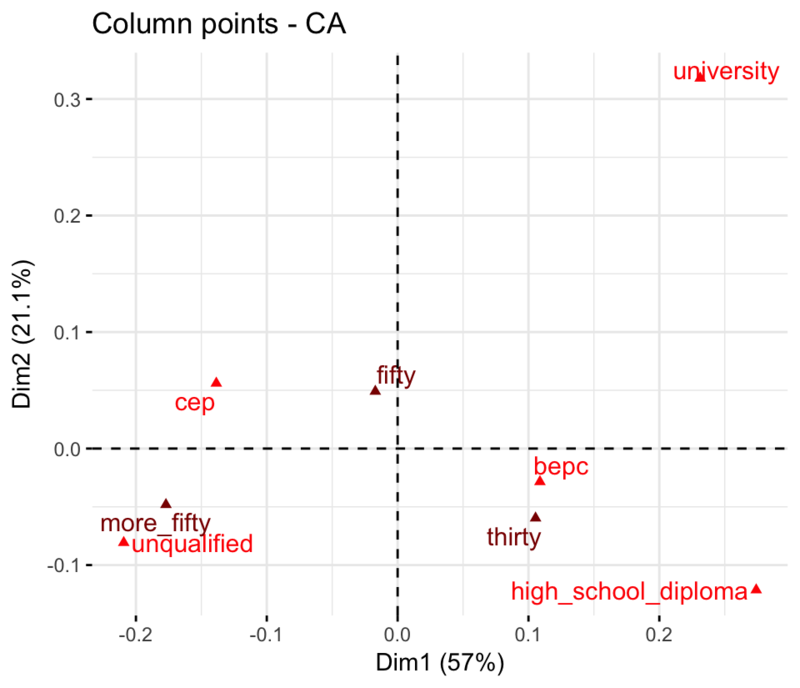 Correspondence analysis (CA) is an extension of principal component analysis (Chapter @ref(principal-component-analysis)) suited to explore relationships among qualitative variables (or categorical data). Like principal component analysis, it provides a solution for summarizing and visualizing data set in two-dimension plots. Here, we describe the simple correspondence analysis, which is used to analyze frequencies formed by two categorical data, a data table known as contengency table. It provides factor scores (coordinates) for both row and column points of contingency table. These coordinates are used to visualize graphically the association between row and column elements in the contingency table. When analyzing a two-way contingency table, a typical question is whether certain row elements are associated with some elements of column elements. 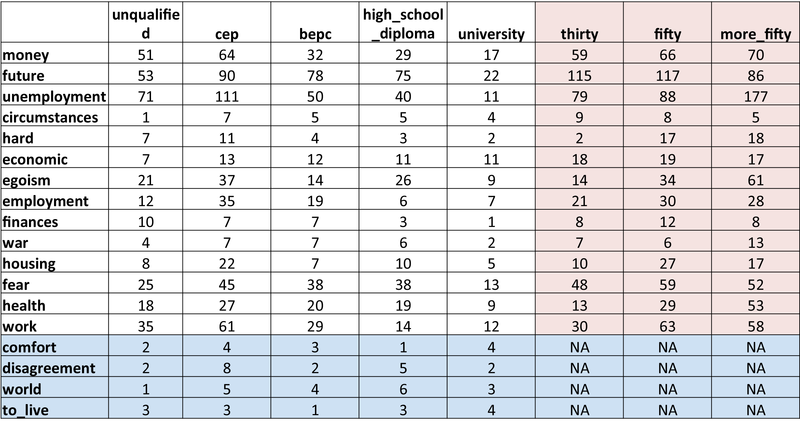 Correspondence analysis is a geometric approach for visualizing the rows and columns of a two-way contingency table as points in a low-dimensional space, such that the positions of the row and column points are consistent with their associations in the table. The aim is to have a global view of the data that is useful for interpretation. 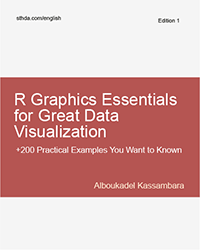 In the current chapter, we’ll show how to compute and interpret correspondence analysis using two R packages: i) FactoMineR for the analysis and ii) factoextra for data visualization. Additionally, we’ll show how to reveal the most important variables that explain the variations in a data set. We continue by explaining how to apply correspondence analysis using supplementary rows and columns. This is important, if you want to make predictions with CA. 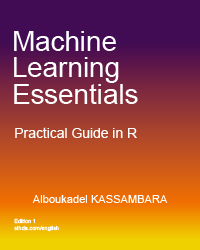 The last sections of this guide describe also how to filter CA result in order to keep only the most contributing variables. Finally, we’ll see how to deal with outliers. 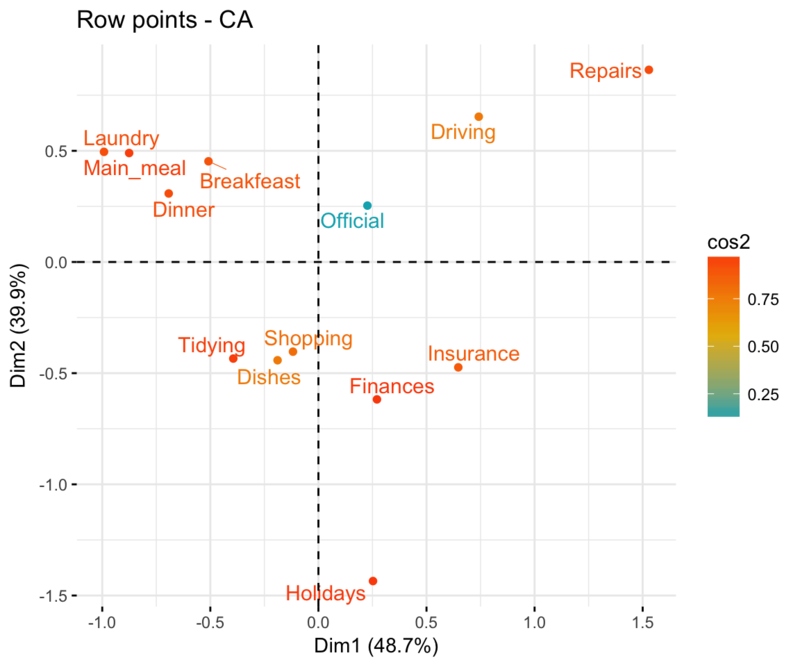 No matter what function you decide to use, you can easily extract and visualize the results of correspondence analysis using R functions provided in the factoextra R package. 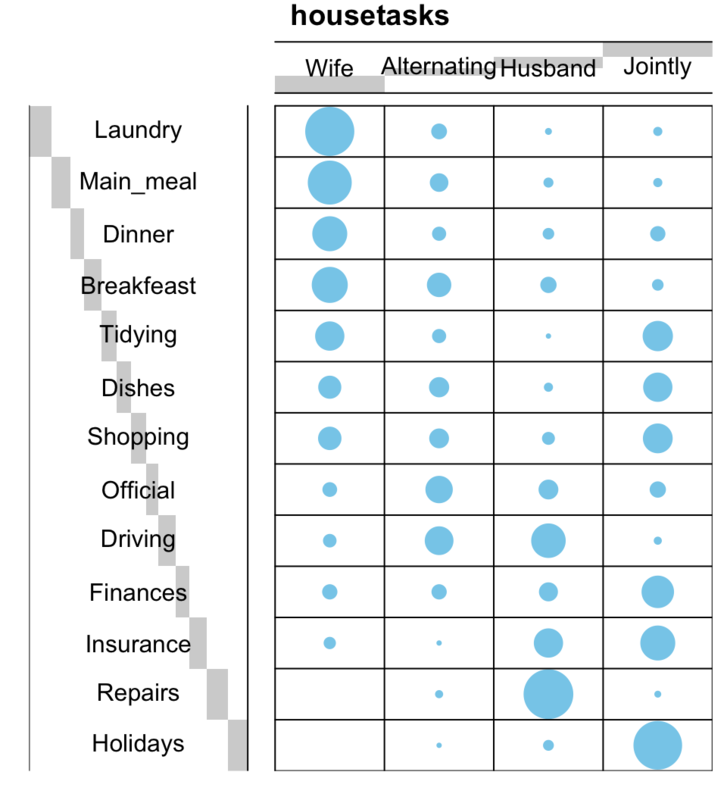 It’s evident that, the housetasks - Laundry, Main_Meal and Dinner - are more frequently done by the “Wife”. Note that, row and column sums are printed by default in the bottom and right margins, respectively. These values are hidden, in the above plot, using the argument show.margins = FALSE. In our example, the row and the column variables are statistically significantly associated (p-value = r chisq$p.value). ncp : number of dimensions kept in the final results. graph : a logical value. If TRUE a graph is displayed. ## The chi square of independence between the two variables is equal to 1944 (p-value =  0 ). ## 2  "$col"            "results for the columns"
## 3  "$col$coord"      "coord. for the columns"
## 4  "$col$cos2"       "cos2 for the columns"
## 5  "$col$contrib"    "contributions of the columns"
## 6  "$row"            "results for the rows"
## 7  "$row$coord"      "coord. for the rows"
## 8  "$row$cos2"       "cos2 for the rows"
## 9  "$row$contrib"    "contributions of the rows"
## 10 "$call"           "summary called parameters"
## 11 "$call$marge.col" "weights of the columns"
## 12 "$call$marge.row" "weights of the rows"
The object that is created using the function CA() contains many information found in many different lists and matrices. These values are described in the next section. get_ca_row(res.ca), get_ca_col(res.ca): Extract the results for rows and columns, respectively. fviz_ca_row(res.ca), fviz_ca_col(res.ca): Visualize the results for rows and columns, respectively. fviz_ca_biplot(res.ca): Make a biplot of rows and columns. To interpret correspondence analysis, the first step is to evaluate whether there is a significant dependency between the rows and columns. A rigorous method is to use the chi-square statistic for examining the association between row and column variables. This appears at the top of the report generated by the function summary(res.ca) orprint(res.ca), see section @ref(r-code-to-compute-ca). 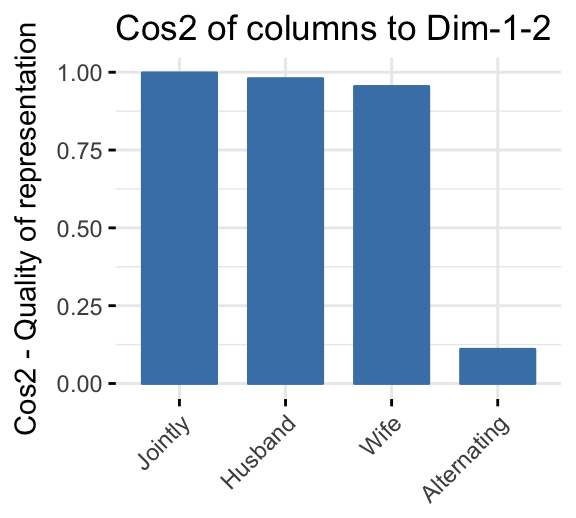 A high chi-square statistic means strong link between row and column variables. In our example, the association is highly significant (chi-square: 1944.456, p = 0). Recall that, we examine the eigenvalues to determine the number of axis to be considered. The eigenvalues and the proportion of variances retained by the different axes can be extracted using the function get_eigenvalue() [factoextra package]. Eigenvalues are large for the first axis and small for the subsequent axis. Eigenvalues correspond to the amount of information retained by each axis. Dimensions are ordered decreasingly and listed according to the amount of variance explained in the solution. Dimension 1 explains the most variance in the solution, followed by dimension 2 and so on. The cumulative percentage explained is obtained by adding the successive proportions of variation explained to obtain the running total. For instance, 48.69% plus 39.91% equals 88.6%, and so forth. Therefore, about 88.6% of the variation is explained by the first two dimensions. Eigenvalues can be used to determine the number of axes to retain. There is no “rule of thumb” to choose the number of dimensions to keep for the data interpretation. It depends on the research question and the researcher’s need. For example, if you are satisfied with 80% of the total variances explained then use the number of dimensions necessary to achieve that. Note that, a good dimension reduction is achieved when the the first few dimensions account for a large proportion of the variability. In our analysis, the first two axes explain 88.6% of the variation. This is an acceptably large percentage. 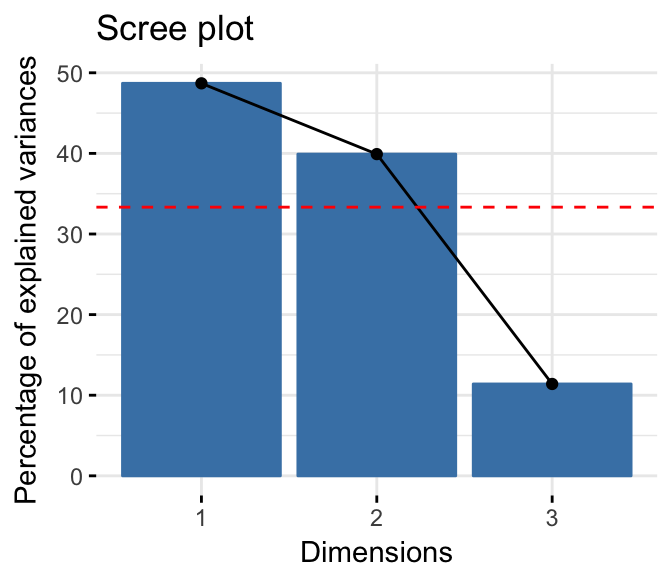 An alternative method to determine the number of dimensions is to look at a Scree Plot, which is the plot of eigenvalues/variances ordered from largest to the smallest. The number of component is determined at the point, beyond which the remaining eigenvalues are all relatively small and of comparable size. 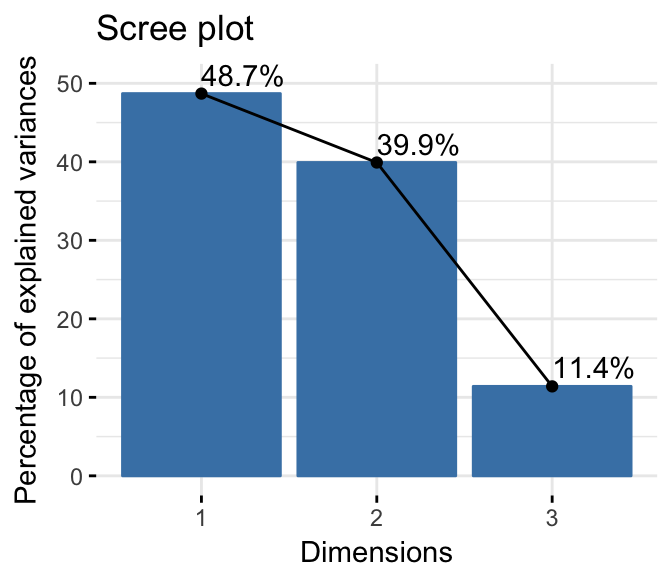 The scree plot can be produced using the function fviz_eig() or fviz_screeplot() [factoextra package]. The point at which the scree plot shows a bend (so called “elbow”) can be considered as indicating an optimal dimensionality. It’s also possible to calculate an average eigenvalue above which the axis should be kept in the solution. Our data contains 13 rows and 4 columns. If the data were random, the expected value of the eigenvalue for each axis would be 1/(nrow(housetasks)-1) = 1/12 = 8.33% in terms of rows. 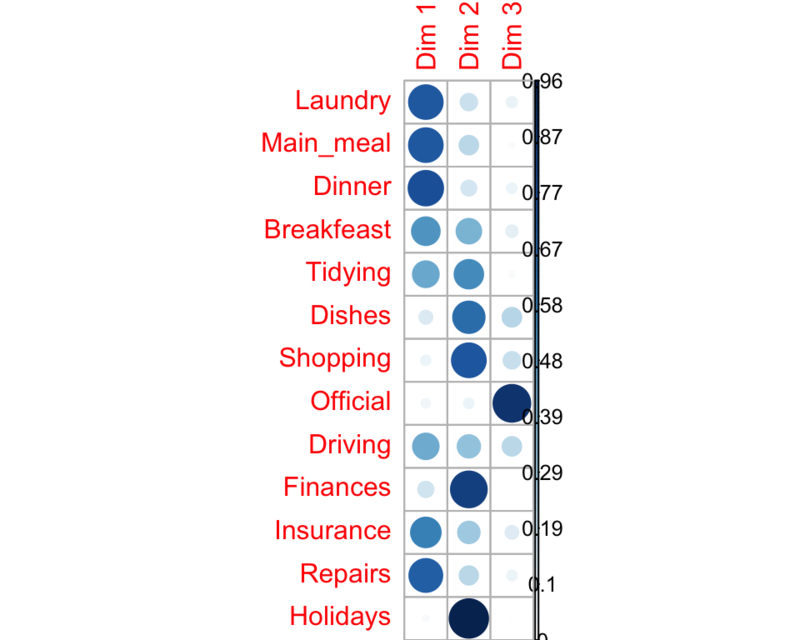 Likewise, the average axis should account for 1/(ncol(housetasks)-1) = 1/3 = 33.33% in terms of the 4 columns. Any axis with a contribution larger than the maximum of these two percentages should be considered as important and included in the solution for the interpretation of the data. According to the graph above, only dimensions 1 and 2 should be used in the solution. The dimension 3 explains only 11.4% of the total inertia which is below the average eigeinvalue (33.33%) and too little to be kept for further analysis. Note that, you can use more than 2 dimensions. However, the supplementary dimensions are unlikely to contribute significantly to the interpretation of nature of the association between the rows and columns. Dimensions 1 and 2 explain approximately 48.7% and 39.9% of the total inertia respectively. This corresponds to a cumulative total of 88.6% of total inertia retained by the 2 dimensions. The higher the retention, the more subtlety in the original data is retained in the low-dimensional solution (M. Bendixen 2003). The function fviz_ca_biplot() [factoextra package] can be used to draw the biplot of rows and columns variables. The graph above is called symetric plot and shows a global pattern within the data. Rows are represented by blue points and columns by red triangles. Symetric plot represents the row and column profiles simultaneously in a common space. In this case, only the distance between row points or the distance between column points can be really interpreted. The distance between any row and column items is not meaningful! You can only make a general statements about the observed pattern. In order to interpret the distance between column and row points, the column profiles must be presented in row space or vice-versa. 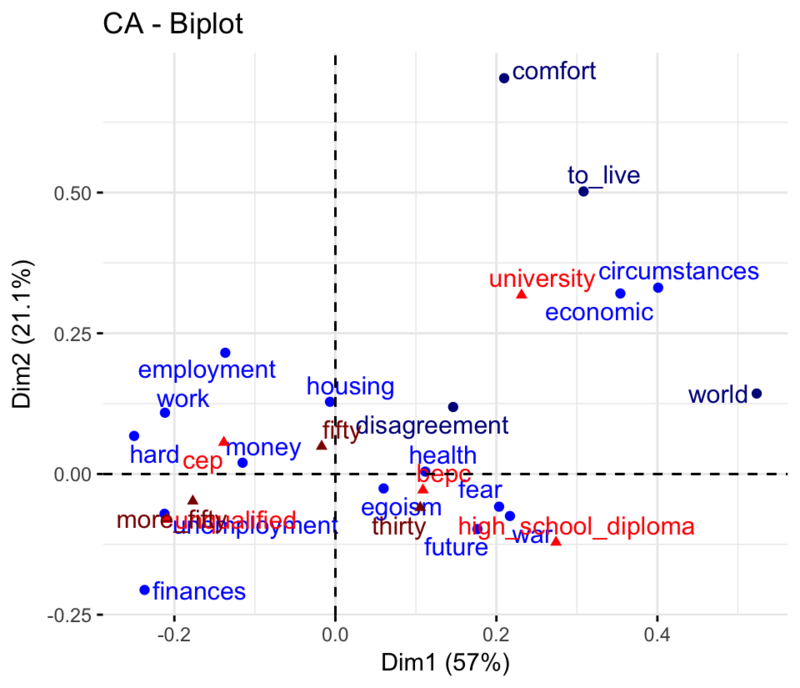 This type of map is called asymmetric biplot and is discussed at the end of this article. 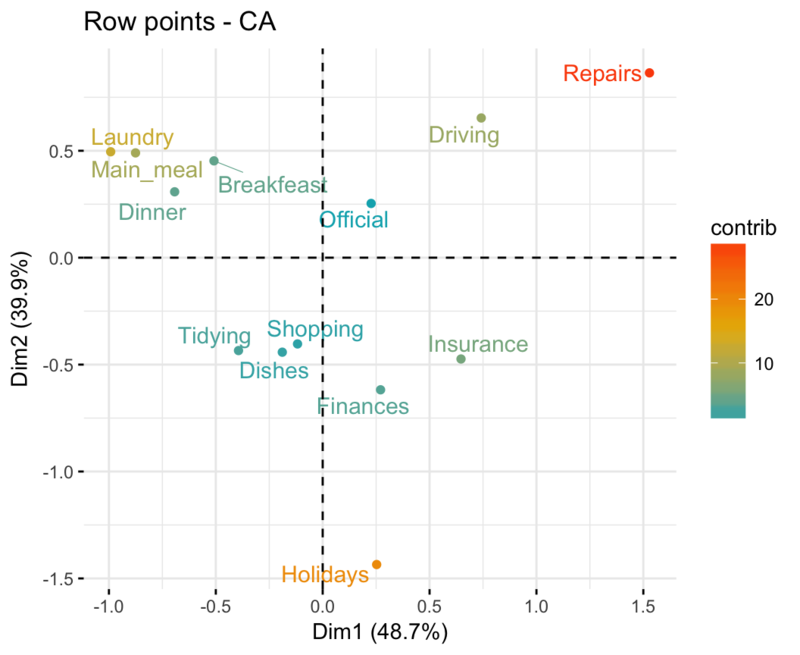 The next step for the interpretation is to determine which row and column variables contribute the most in the definition of the different dimensions retained in the model. ## 1 "$coord"   "Coordinates for the rows"
## 2 "$cos2"    "Cos2 for the rows"
## 3 "$contrib" "contributions of the rows"
## 4 "$inertia" "Inertia of the rows"
row$coord: coordinates of each row point in each dimension (1, 2 and 3). Used to create the scatter plot. row$cos2: quality of representation of rows. var$contrib: contribution of rows (in %) to the definition of the dimensions. Note that, it’s possible to plot row points and to color them according to either i) their quality on the factor map (cos2) or ii) their contribution values to the definition of dimensions (contrib). In this section, we describe how to visualize row points only. Next, we highlight rows according to either i) their quality of representation on the factor map or ii) their contributions to the dimensions. Rows with a similar profile are grouped together. Negatively correlated rows are positioned on opposite sides of the plot origin (opposed quadrants). The distance between row points and the origin measures the quality of the row points on the factor map. Row points that are away from the origin are well represented on the factor map. The result of the analysis shows that, the contingency table has been successfully represented in low dimension space using correspondence analysis. The two dimensions 1 and 2 are sufficient to retain 88.6% of the total inertia (variation) contained in the data. However, not all the points are equally well displayed in the two dimensions. Recall that, the quality of representation of the rows on the factor map is called the squared cosine (cos2) or the squared correlations. The values of the cos2 are comprised between 0 and 1. The sum of the cos2 for rows on all the CA dimensions is equal to one. The quality of representation of a row or column in n dimensions is simply the sum of the squared cosine of that row or column over the n dimensions. If a row item is well represented by two dimensions, the sum of the cos2 is closed to one. For some of the row items, more than 2 dimensions are required to perfectly represent the data. Note that, all row points except Official are well represented by the first two dimensions. This implies that the position of the point corresponding the item Official on the scatter plot should be interpreted with some caution. A higher dimensional solution is probably necessary for the item Official. The row variables with the larger value, contribute the most to the definition of the dimensions. 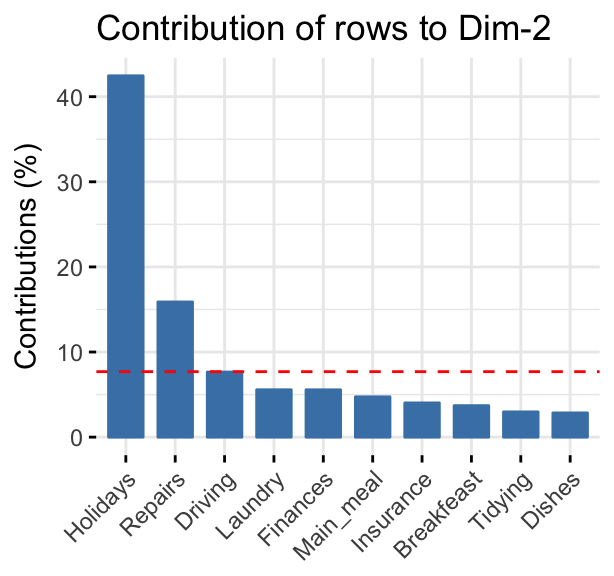 Rows that contribute the most to Dim.1 and Dim.2 are the most important in explaining the variability in the data set. Rows that do not contribute much to any dimension or that contribute to the last dimensions are less important. The red dashed line on the graph above indicates the expected average value, If the contributions were uniform. The calculation of the expected contribution value, under null hypothesis, has been detailed in the principal component analysis chapter (@ref(principal-component-analysis)). 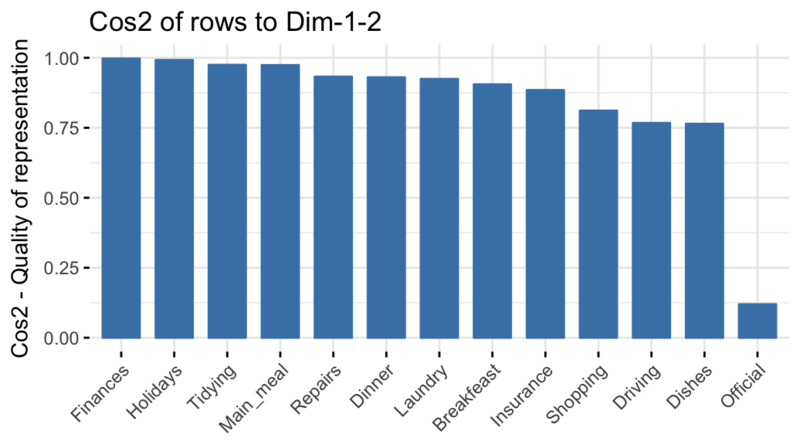 the row items Repairs, Laundry, Main_meal and Driving are the most important in the definition of the first dimension. 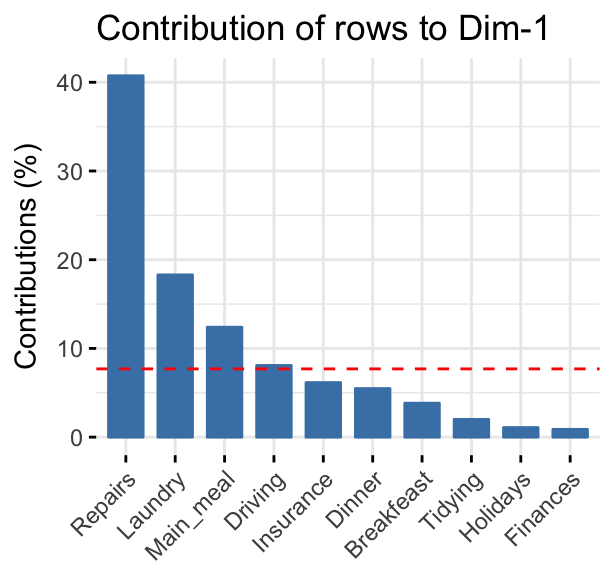 the row items Holidays and Repairs contribute the most to the dimension 2. 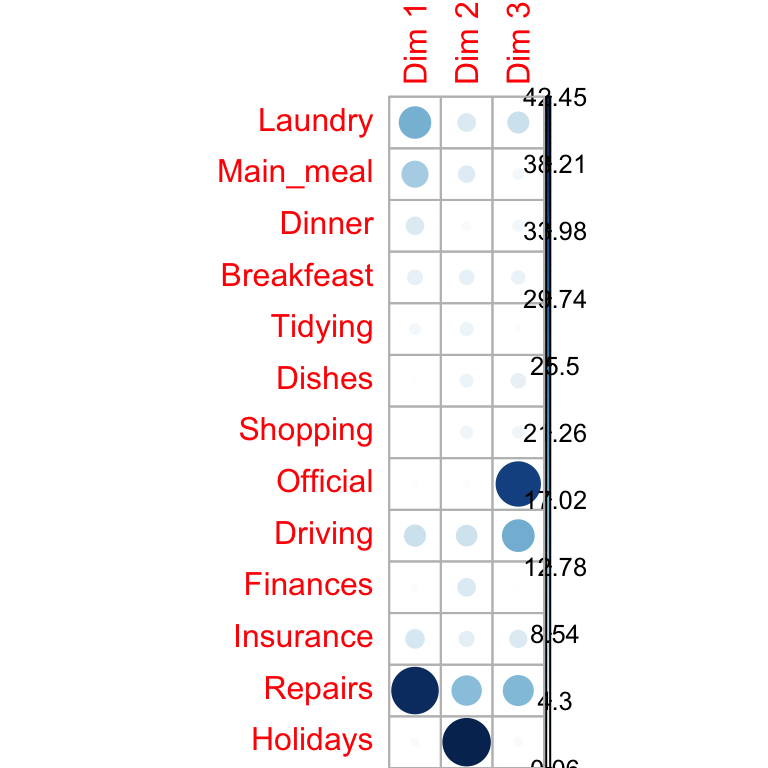 The scatter plot gives an idea of what pole of the dimensions the row categories are actually contributing to. It is evident that row categories Repair and Driving have an important contribution to the positive pole of the first dimension, while the categories Laundry and Main_meal have a major contribution to the negative pole of the first dimension; etc, …. In other words, dimension 1 is mainly defined by the opposition of Repair and Driving (positive pole), and Laundry and Main_meal (negative pole). ## 1 "$coord"   "Coordinates for the columns"
## 2 "$cos2"    "Cos2 for the columns"
## 3 "$contrib" "contributions of the columns"
## 4 "$inertia" "Inertia of the columns"
The result for columns gives the same information as described for rows. For this reason, we’ll just displayed the result for columns in this section with only a very brief comment. Recall that, the value of the cos2 is between 0 and 1. A cos2 closed to 1 corresponds to a column/row variables that are well represented on the factor map. Note that, only the column item Alternating is not very well displayed on the first two dimensions. The position of this item must be interpreted with caution in the space formed by dimensions 1 and 2. 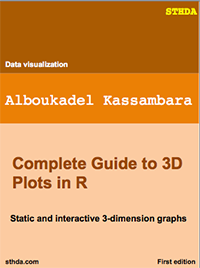 Biplot is a graphical display of rows and columns in 2 or 3 dimensions. 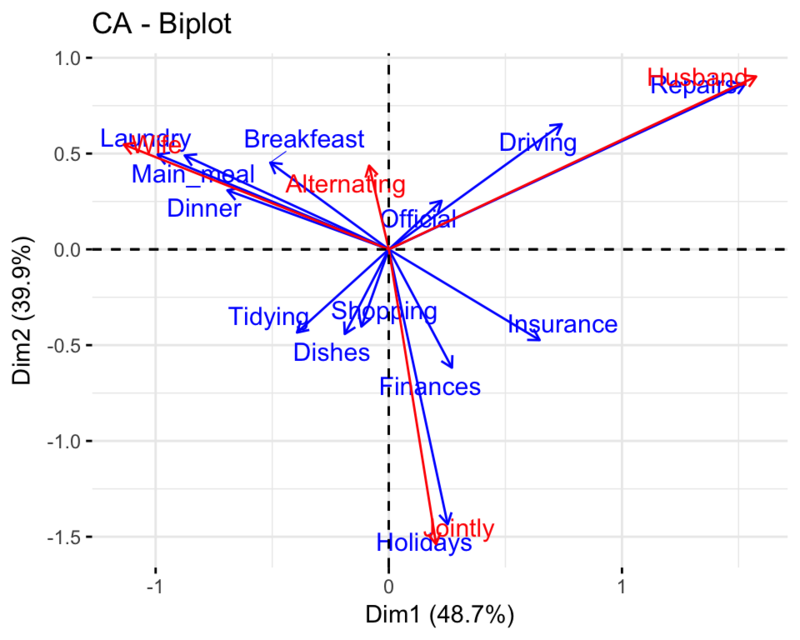 We have already described how to create CA biplots in section @ref(ca-biplot). 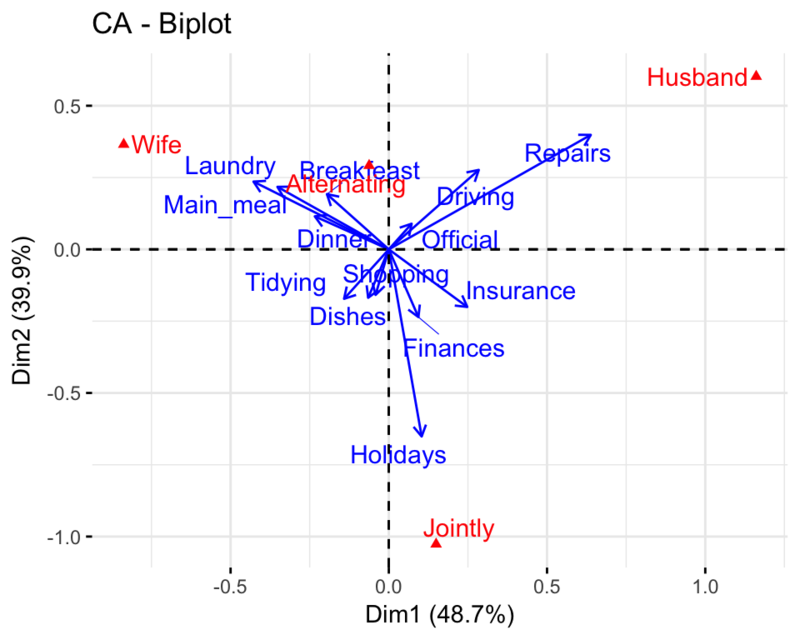 Here, we’ll describe different types of CA biplots. As mentioned above, the standard plot of correspondence analysis is a symmetric biplot in which both rows (blue points) and columns (red triangles) are represented in the same space using the principal coordinates. These coordinates represent the row and column profiles. In this case, only the distance between row points or the distance between column points can be really interpreted. With symmetric plot, the inter-distance between rows and columns can’t be interpreted. Only a general statements can be made about the pattern. Note that, in order to interpret the distance between column points and row points, the simplest way is to make an asymmetric plot. This means that, the column profiles must be presented in row space or vice-versa. To make an asymetric biplot, rows (or columns) points are plotted from the standard co-ordinates (S) and the profiles of the columns (or the rows) are plotted from the principale coordinates (P) (M. Bendixen 2003). Depending on the situation, other types of display can be set using the argument map (Nenadic and Greenacre 2007) in the function fviz_ca_biplot() [in factoextra]. "rowprincipal" or "colprincipal" - these are the so-called asymmetric biplots, with either rows in principal coordinates and columns in standard coordinates, or vice versa (also known as row-metric-preserving or column-metric-preserving, respectively). 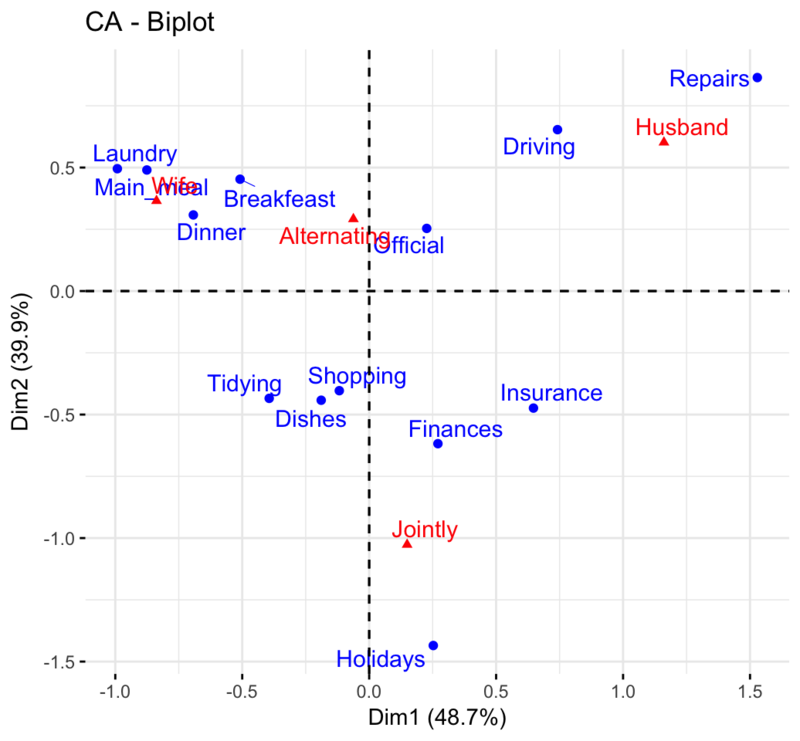 "symbiplot" - both rows and columns are scaled to have variances equal to the singular values (square roots of eigenvalues), which gives a symmetric biplot but does not preserve row or column metrics. "rowgab": rows in principal coordinates and columns in standard coordinates multiplied by the mass. "colgab": columns in principal coordinates and rows in standard coordinates multiplied by the mass. "rowgreen" or "colgreen": The so-called contribution biplots showing visually the most contributing points (Greenacre 2006b). "rowgreen": rows in principal coordinates and columns in standard coordinates multiplied by square root of the mass. "colgreen": columns in principal coordinates and rows in standard coordinates multiplied by the square root of the mass. We used, the argument arrows, which is a vector of two logicals specifying if the plot should contain points (FALSE, default) or arrows (TRUE). The first value sets the rows and the second value sets the columns. If the angle between two arrows is acute, then their is a strong association between the corresponding row and column. To interpret the distance between rows and and a column you should perpendicularly project row points on the column arrow. 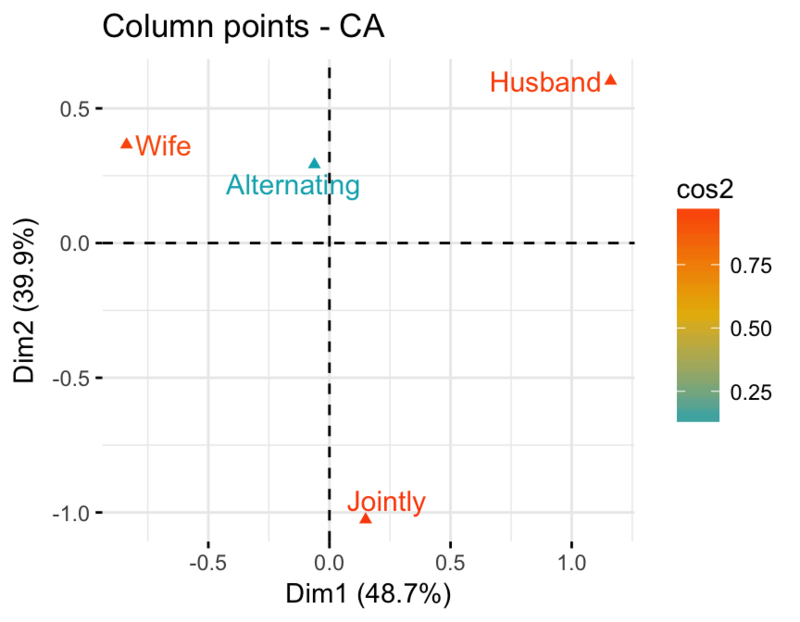 In the standard symmetric biplot (mentioned in the previous section), it’s difficult to know the most contributing points to the solution of the CA. Michael Greenacre proposed a new scaling displayed (called contribution biplot) which incorporates the contribution of points (M. Greenacre 2013). In this display, points that contribute very little to the solution, are close to the center of the biplot and are relatively unimportant to the interpretation. A contribution biplot can be drawn using the argument map = “rowgreen” or map = “colgreen”. Firstly, you have to decide whether to analyse the contributions of rows or columns to the definition of the axes. In our example we’ll interpret the contribution of rows to the axes. The argument map ="colgreen" is used. In this case, recall that columns are in principal coordinates and rows in standard coordinates multiplied by the square root of the mass. For a given row, the square of the new coordinate on an axis i is exactly the contribution of this row to the inertia of the axis i. In the graph above, the position of the column profile points is unchanged relative to that in the conventional biplot. However, the distances of the row points from the plot origin are related to their contributions to the two-dimensional factor map. The closer an arrow is (in terms of angular distance) to an axis the greater is the contribution of the row category on that axis relative to the other axis. If the arrow is halfway between the two, its row category contributes to the two axes to the same extent. Dimension 2 is mainly defined by the row category Holidays. The row category Driving contributes to the two axes to the same extent. To easily identify row and column points that are the most associated with the principal dimensions, you can use the function dimdesc() [in FactoMineR]. Row/column variables are sorted by their coordinates in the dimdesc() output. 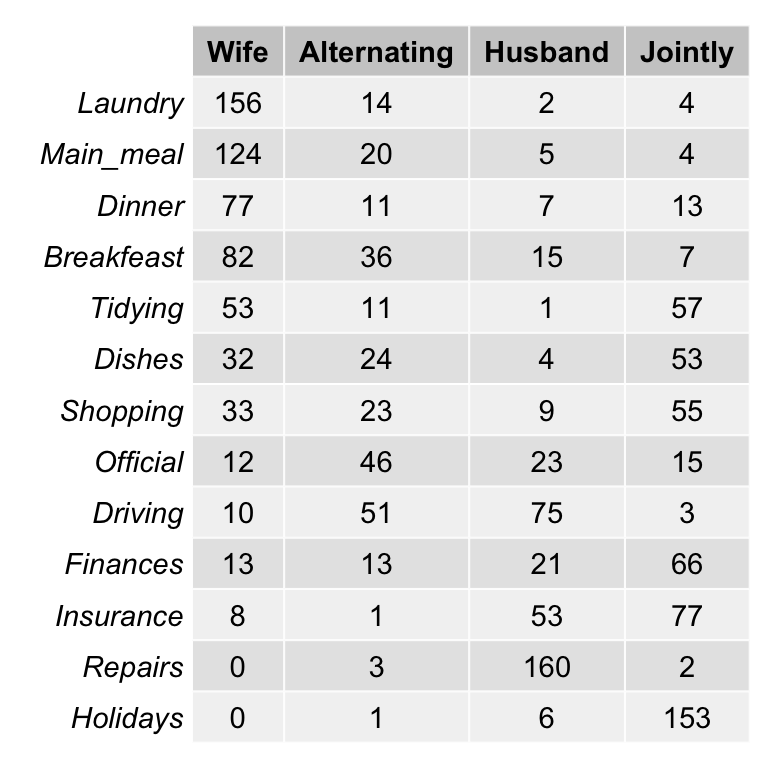 The data used here is a contingency table describing the answers given by different categories of people to the following question: What are the reasons that can make hesitate a woman or a couple to have children? Only some of the rows and columns will be used to perform the correspondence analysis (CA). The coordinates of the remaining (supplementary) rows/columns on the factor map will be predicted after the CA. Active rows (rows 1:14) : Rows that are used during the correspondence analysis. 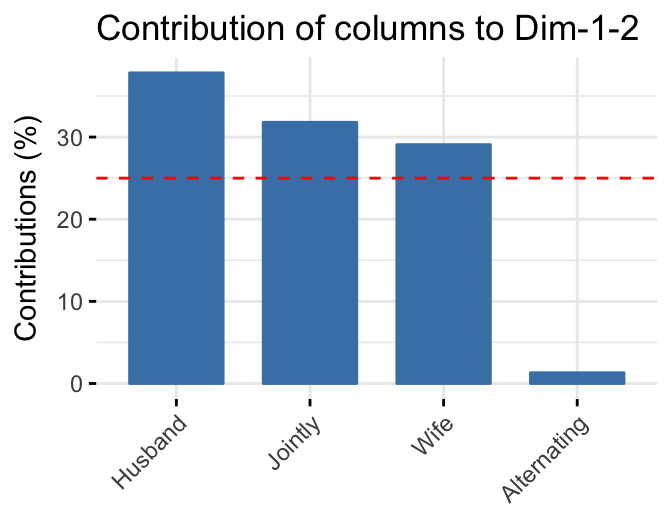 Active columns (columns 1:5) : Columns that are used for the correspondence analysis. Supplementary columns (col.sup 6:8) : As supplementary rows, the coordinates of these columns will be predicted also. As mentioned above, supplementary rows and columns are not used for the definition of the principal dimensions. Their coordinates are predicted using only the information provided by the performed CA on active rows/columns. Supplementary rows are shown in darkblue color. Supplementary columns are shown in darkred. If you have many row/column variables, it’s possible to visualize only some of them using the arguments select.row and select.col. If one or more “outliers” are present in the contingency table, they can dominate the interpretation the axes (M. Bendixen 2003). 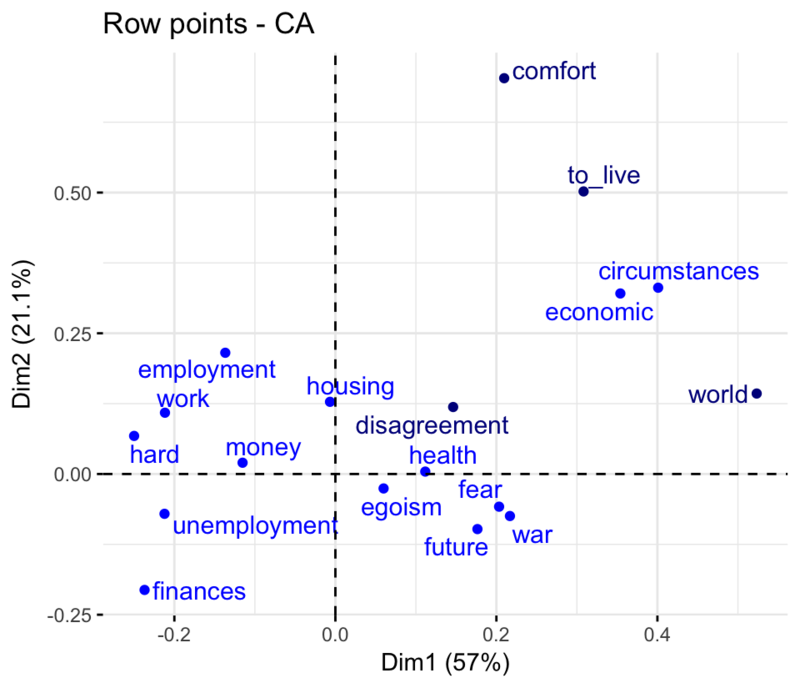 Outliers are points that have high absolute co-ordinate values and high contributions. They are represented, on the graph, very far from the centroïd. In this case, the remaining row/column points tend to be tightly clustered in the graph which become difficult to interpret. In the CA output, the coordinates of row/column points represent the number of standard deviations the row/column is away from the barycentre (M. Bendixen 2003). Outliers are points that are are at least one standard deviation away from the barycentre. They contribute also, significantly to the interpretation to one pole of an axis. There are no apparent outliers in our data. If there were outliers in the data, they must be suppressed or treated as supplementary points when re-running the correspondence analysis. In conclusion, we described how to perform and interpret correspondence analysis (CA). We computed CA using the CA() function [FactoMineR package]. Next, we used the factoextra R package to produce ggplot2-based visualization of the CA results. 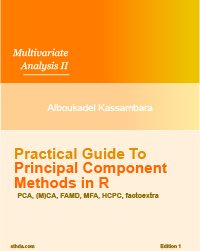 Principal component analysis (article). 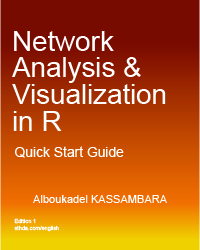 (Abdi and Williams 2010). https://goo.gl/1Vtwq1. Bendixen, Mike. 2003. “A Practical Guide to the Use of Correspondence Analysis in Marketing Research.” Marketing Bulletin 14. http://marketing-bulletin.massey.ac.nz/V14/MB_V14_T2_Bendixen.pdf. Bendixen, Mike T. 1995. 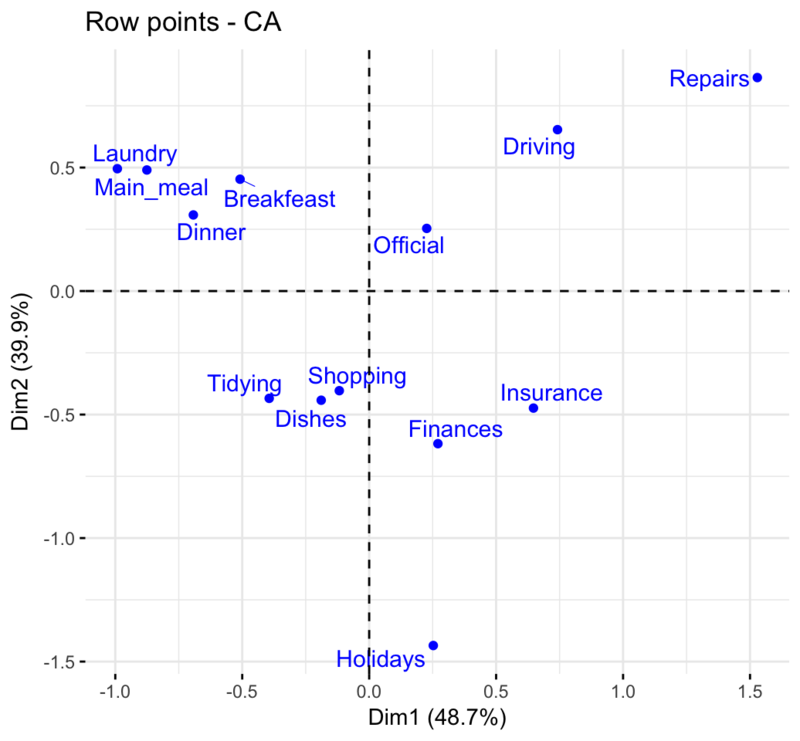 “Compositional Perceptual Mapping Using Chi‐squared Trees Analysis and Correspondence Analysis.” Journal of Marketing Management 11 (6): 571–81. doi:10.1080/0267257X.1995.9964368. Gabriel, K. Ruben, and Charles L. Odoroff. 1990. “Biplots in Biomedical Research.” Statistics in Medicine 9 (5). Wiley Subscription Services, Inc., A Wiley Company: 469–85. doi:10.1002/sim.4780090502. Greenacre, Michael. 2013. 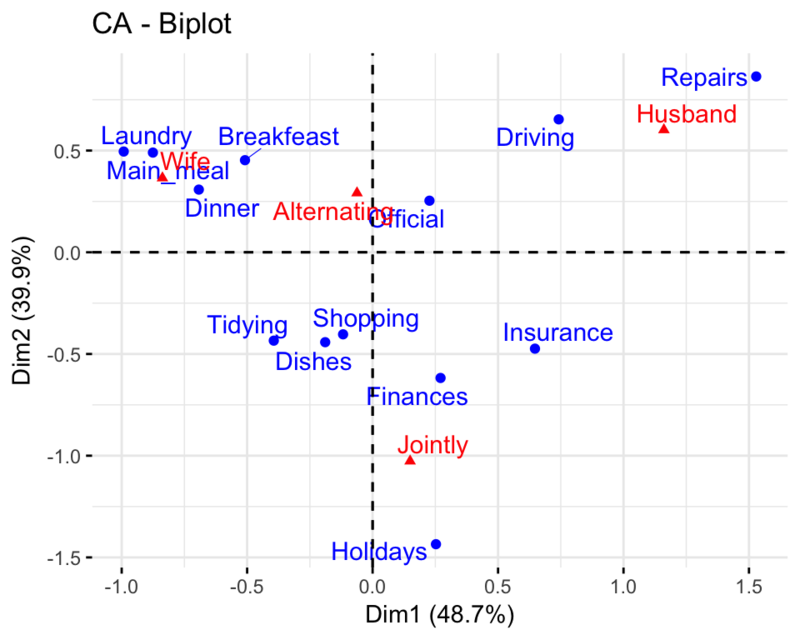 “Contribution Biplots.” Journal of Computational and Graphical Statistics 22 (1): 107–22. http://dx.doi.org/10.1080/10618600.2012.702494. Nenadic, O., and M. Greenacre. 2007. “Correspondence Analysis in R, with Two- and Three-Dimensional Graphics: The ca Package.” Journal of Statistical Software 20 (3): 1–13. http://www.jstatsoft.org. Dear Kassambra, in the function fviz_ca_biplot how do I change the size of the points of the row or column only. Can I just change the shapes (shape.row, shape.col) would have something like pointsize.col or pointsize.row? I have R.3.3.2 on MAC OS X and it works on my computer. Hi, I can't find any of these packages--factomineR, ca, etc...on my R 3.3.2...is this no longer available?